Beam is hanged to the ceiling via two ropes. Masses of ropes are so small that it is possible to omit them in computation. Beam has mass m[kg]. Force F[N] is placed in specified beam’s point. 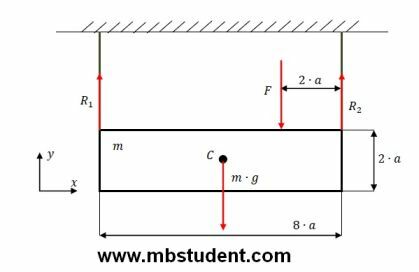 Static equilibrium equations for system have to be calculated. Reaction forces in ropes also have to be calculated. Beam is in gravity field. Beam has length 8·a. Gravity force which works on beam has to be placed in beam’s gravity center C.